Global Engineering and Materials, Inc. (GEM) has developed an Extended Finite Element Toolkit for Abaqus to characterize 3D crack onset and growth in composite and metallic structures under monotonic and fatigue loading. The toolkit was developed under the sponsorship of the US Air Force, Office of Naval Research, and NAVAIR. A Collaborative R&D relationship has also been established between GEM and Northwestern University (NWU), University of Dayton Institute (UDRI), University of Miami, SIMULIA, University of Texas at El Paso (UTEP), University of California at Davis (UCDAVIS), Naval Surface Warfare Center Carderock Division (NSWCCD), Lockheed Martin Aero (LM), Sikorsky Aircraft, Aloca Technical Center (ATC), and Bell Helicopter to further enhance toolkit development. Further development of new toolkit features and capabilities will continue under various DOD and commercial industry initiatives. GEM along with its team members (NWU and UCDAVIS) has developed XFA3D by implementing a three-dimensional extended finite element method (X-FEM) coupled with a narrow band fast marching method (FMM) in the Abaqus finite element package. The toolkit can be used to simulate a curvilinear crack growth in a metallic structure without re-meshing and can evaluate the residual strength and life of a flawed structural component subjected to monotonic and fatigue loading. 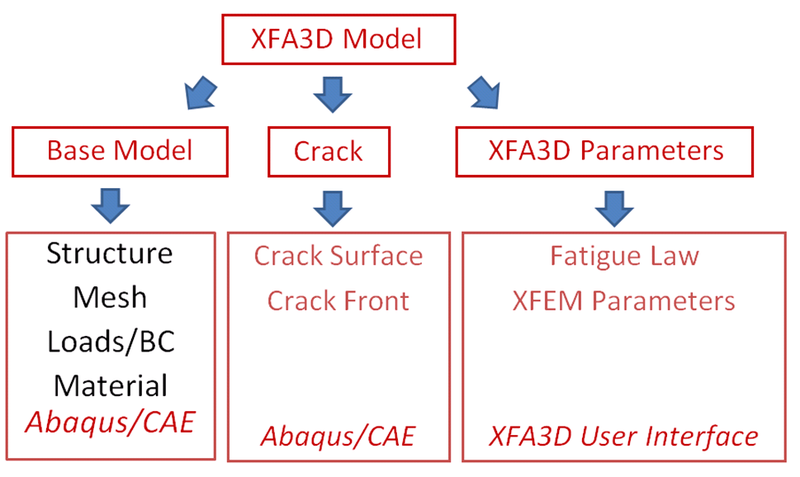 The main features of the XFA3D include: 1) model preparation and arbitrary insertion of initial cracks that are independent of the base model via Abaqus/CAE; 2) extraction of stress intensity factors on static or growing crack fronts in metallic structures via the crack tip opening displacement (CTOD) and life predictions for constant or variable fatigue load; and 3) post-processing of the cracked region using Abaqus/Viewer. 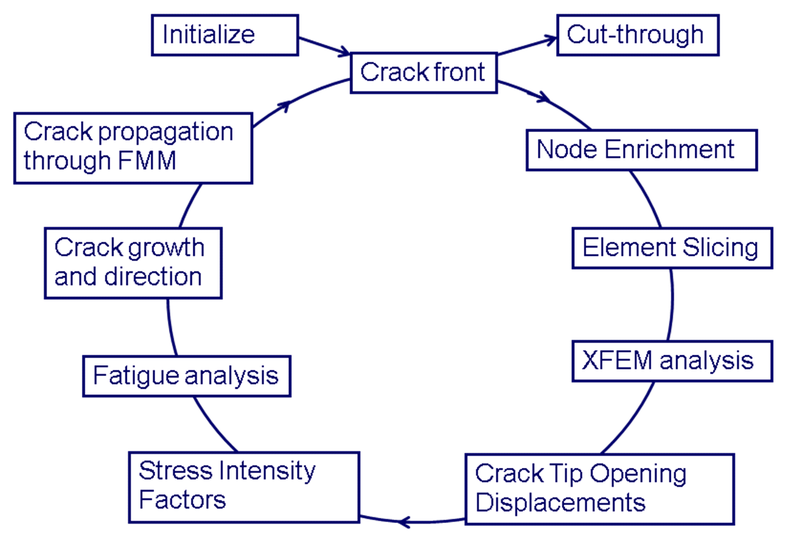 The critical components of the XFA3D include: the level set representation and updates for a stationary and growing crack, the penalty approach for interface interactions in crack closure and friction, the element slicing state recovery algorithm for elasto-plastic fracture problems, and the extraction of fracture driving force along the crack front. Based on Abaqus existing APIs, a seamless integration with Abaqus/Standard and Abaqus/CAE has been accomplished. The Architecture of XFA3D works with COTS Abaqus suite with a minimum footprint and installation efforts. A mesh independent crack representation is achieved via the use of two levelset functions φ and ψ to describe a crack surface and crack front respectively. Both a curved crack plane and its front can be accurately captured using the nodal values of the levelset (Lset) functions associated with the base model without a crack. In the illustrative tee joint example, a curved rectangular crack is inserted into the joint. Two level set values are plotted for all the nodes within the selected enrichment zone. The layered colored contours in φ indicate the distance between the cracked plane and a sampling plane. Similarly, the annular colored contour in ψ represents the distance between the crack front and a nearby circle surrounding the crack front. Given the nodal values and signs of these two levelset functions (ψ, φ), a relative position between a crack front and its surrounding element can be determined to assign the enrichment type for all the nodes in a pre-defined enrichment zone. For elements in the vicinity of the crack front, a tip enrichment that incorporates the characteristics of the near tip field is employed while a jump enrichment is applied for all the nodes located in the wake of the crack. Due to the mesh independent nature in X-FEM, the crack does not have to grow from one node to the next nodal point. An arbitrary increment (δai ) can be assigned to an active crack front based on the magnitude of the local crack driving force. 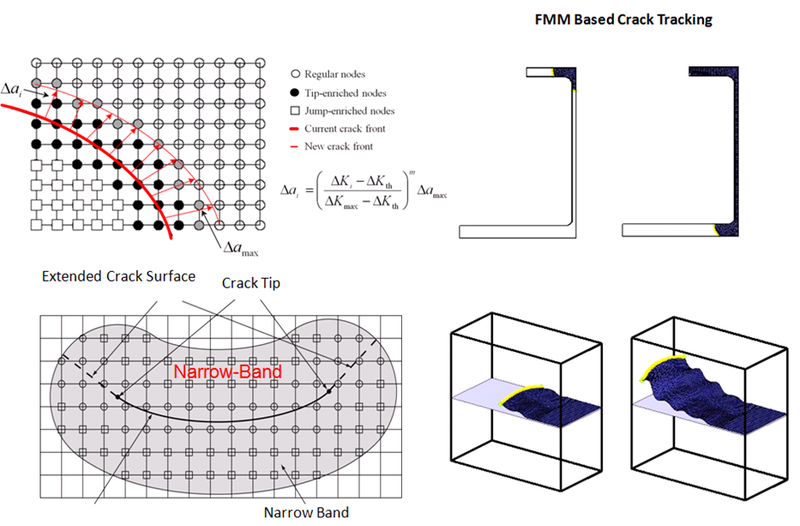 After determining the crack front, the nodal levelset values have to be updated via the narrow-band fast marching method (FMM). For elements cut by the crack front, a slicing technique has been implemented in XFA3D to divide the element into a set of triangular zones where the jump function has no sign changed. Key steps consist of 1) identifying cutting points of the intersected facets; 2) slicing facets into triangles; and 3) generating tetrahedral sub-elements. 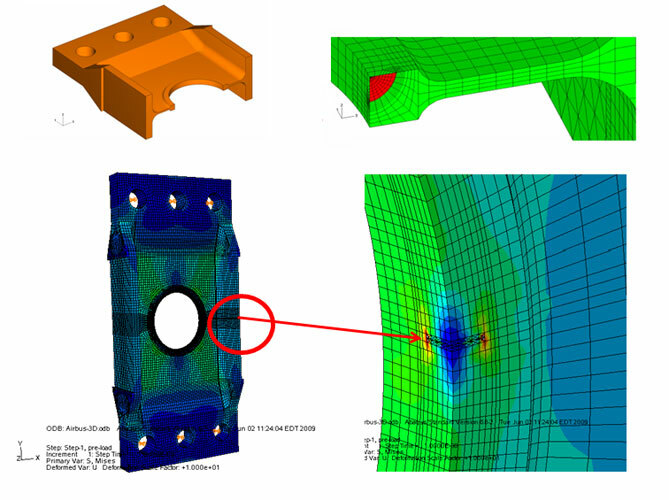 The XFA3D analysis work flow includes the XFA model preparation using our customized Abaqus/CAE, execution of the X-FEM preprocessor to initialize levelset values for a given component and crack geometry, execution of the X-FEM solver with UEL, and visualize X-FEM results using a customized Abaqus/Viewer. The customized Abaqus/CAE will allow the users to build the base FEM model without a crack, insert an initial crack with a given location and orientation, specify X-FEM solution and post-processing parameters, and automatically generate all the X-FEM analysis files. XFA3D toolkit validation and verification have been conducted at component and structural level. A modified compact specimen is used to test the accuracy of the XFA3D prediction in terms of near tip fracture parameters, curvilinear crack path, and fatigue life. To examine the sensitivity of a finite element mesh on the crack path prediction, both a free mesh and a structured mesh are used. The use of XFA3D for these two meshing schemes has shown almost identical results in the overall crack path and the von Mises stress distribution at the final failure configuration. To explore the accuracy of the crack path prediction, the XFEM crack path results are plotted in the digital images of the actual test specimens. The measured crack paths for both the sink and miss cases are in excellent agreement with the corresponding XFEM prediction. Fatigue life prediction is also performed using XFA3D and the accuracy in the life and stress intensity factor prediction is examined through the comparison with the corresponding reference solutions. The component level validation is illustrated next by performing the fatigue life prediction of a helicopter lift frame test module subjected to a spectrum loading. The problem statement along with the operating load profile is provided by Airbus. An initial quarter circular crack is embedded at the corner edge of a flanged plate with a central lightening hole. 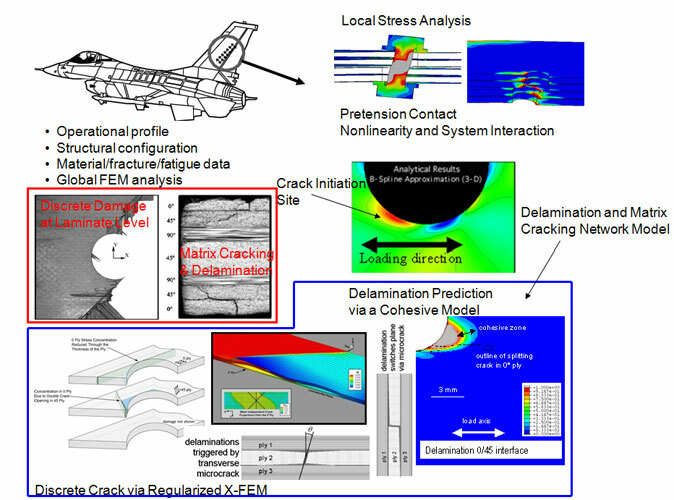 Due to the complexity in the spectrum loading, two solution steps are performed: 1) use of the 3D X-FEM toolkit to determine the functional relation between the crack length and its associated stress intensity factors; and 2) perform the post fatigue life prediction using the AFGROW originally developed by the Air Force Research Laboratory. 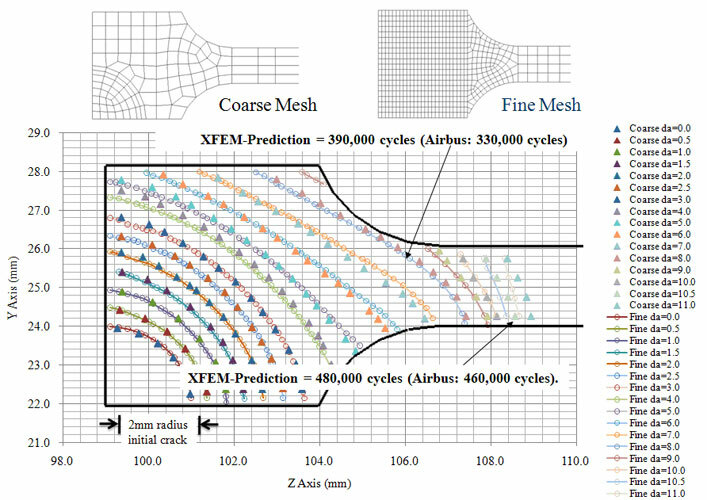 The generated XFEM analysis files include a solid model file for the component without the crack, a crack mesh file to define the crack geometry, and XFEM model input file to define the enrichment zone size, the offset distance for the CTOD sampling, and the levelset representation grid size. 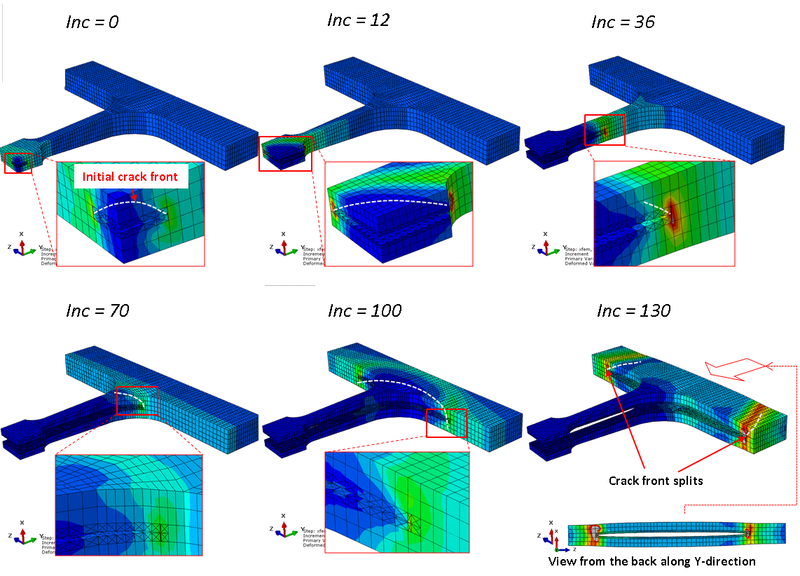 The analysis results include regular solutions (displacement and stress variables) that are viewable in CAE, the location of sampling tip points along the crack front time increment, and the stress intensity factors (SIFs) along the moving crack front. In order to capture the fatigue damage accumulation under a general spectrum loading, the simulated relation between the SIF and the current crack size (a) (i.e. K(a) curve) can be imported into AFGROW for the fatigue life prediction. Snap shots on the crack front evolution along with the crack opening is displayed below along with the deformed shape and the von. The misses stress distribution at the final configuration of the fatigue analysis. Using two mesh densities, the crack profiles comparison at various levels of fatigue cycles are plotted via a cross-sectional view. The XFA3D toolkit can provide an accurate prediction with a relatively coarse mesh. In addition, a good life prediction has been achieved by comparing XFEM results with the Airbus test data at two levels of fatigue cycles. Enhanced capability for XFA3D has recently been added for the fatigue damage simulation of welded aluminum structures under blocking loading. 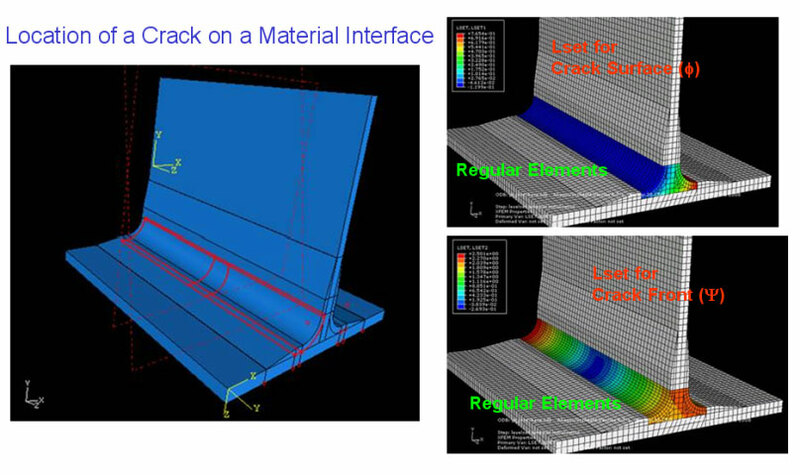 To alleviate the computational burden associated with the insertion and propagation of arbitrary cracks in the presence of welding induced residual stress field, a nodal enriched displacement field coupled with a level set description is integrated with a hybrid implicit and explicit crack representation approach. A simplified residual stress characterization is implemented without invoking two separate analyses during each step of the crack growth. A stress ratio dependent fatigue damage accumulation model is employed for the fatigue damage accumulation under an arbitrary multi-block loading spectrum. Simulation of a surface crack growth in a crucial form tensile specimen is performed in the presence of a self-equilibrium residual stress field. 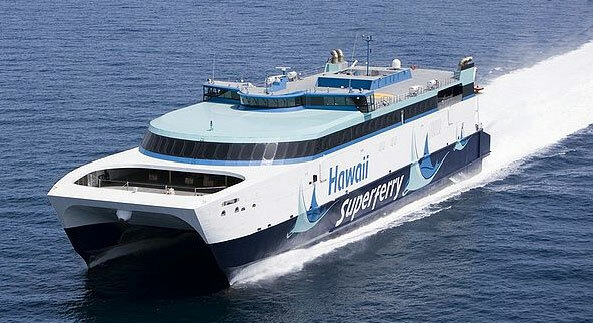 The design of large aluminum high-speed vessel operating under hostile environments requires the welded structure to withstand sub-critical growth of manufacturing flaws and service-induced defects against failure under extreme dynamic loading. The compounding effects from material heterogeneity and reduced strength in HAZ will make the welded aluminum structure prone to crack initiation under normal operating condition. In the presence of unexpected extreme loading events, these initial flaws will propagate, branch, and be arrested by the nearby stiffeners. The complexity in component geometry, material heterogeneity, and the 3D stress distribution, will likely make the 3D crack growth curvilinear with turning from the skin to the stiffener. 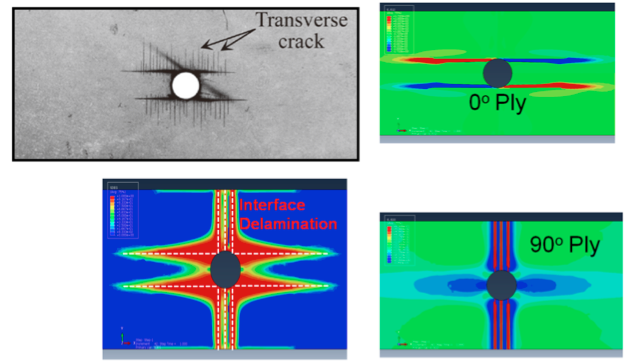 Failure to account for the 3D crack geometry may lead to poor predictions of the crack tip driving force which will have a pronounced impact on the fracture pattern and its resulting load-deflection prediction. The typical size of a stiffened aluminum panel used in ship structures is about 10m x 10m with a thickness of 0.013m. The computational effort associated with the use of the solid elements in the finite element modeling will be prohibitively expensive for maintaining a good element aspect ratio for the thin and planar structures. Structural shell elements are widely used because they offer the advantage of using large elements while maintaining adequate numerical accuracy. It is therefore highly desirable to develop a shell element based X-FEM tool for the design and certification of large scale structures. Under an ONR sponsored STTR program, GEM along with the University of Texas at EL Paso (UTEP) is developing a software tool (XSHELL) for fracture evaluation and load deflection prediction of welded aluminum ship structures subjected to impulsive loading. The XSHELL tool is developed by enhancing and integrating an extended finite element method (XFEM) for dynamic fracture of thin shells in Abaqus. Two validation examples are selected for the simulation of indentation tests conducted by by Hagbart et al. (2009a and 2009b) for the unstiffened and stiffened panel. The plate is welded to a very stiff frame constructed by box beams. To simplify the analysis, a local welded zone is characterized by increasing the plate/stiffener thickness for the overlay region by a constant value based on the specification of the width/depth of its cross-section. Given the variation of the width and depth of the triangular welding, a constant increased thickness is used for the welding region in our computational model. Under a prescribed vertical displacement of an indenter, a crack is initiated in the stress concentration zone. To verify and validate the XSHELL toolkit, the prediction from using the toolkit from Northwestern University (NWU) is also given along with the test data on the force displacement curve. The response and failure prediction from XSHELL agree well with the experimental observation. Hagbart S. Alsos, and Jogen Amdahl (2009a). 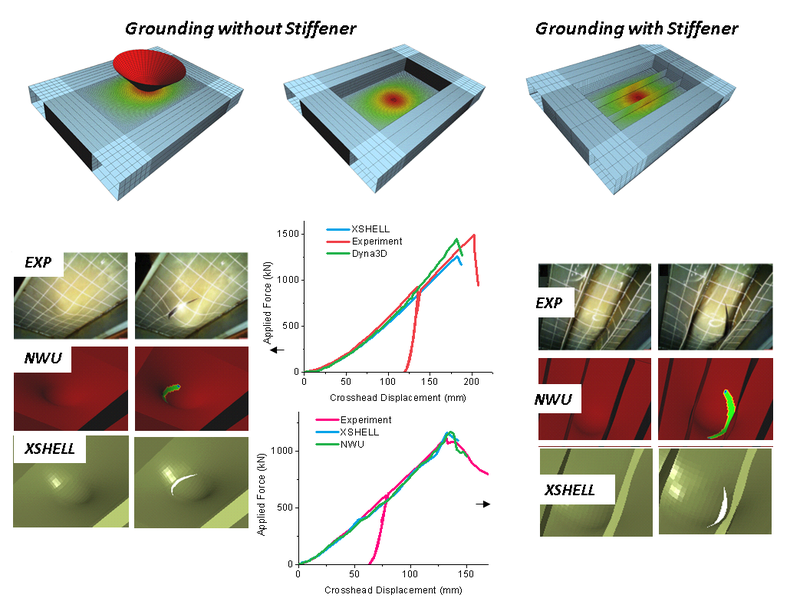 On the resistance to penetration of stiffened plates, Part I – Experiments, International Journal of Impact Engineering, 36: 799-807. Hagbart S. Alsos, and Jogen Amdahl (2009b). 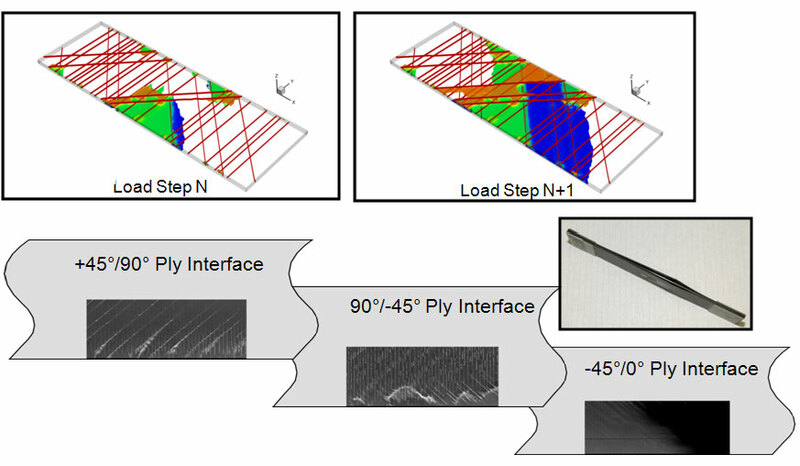 On the resistance to penetration of stiffened plates, Part II – Numerical analysis, International Journal of Impact Engineering, 36: 875-887. Global Engineering and Materials, Inc. (GEM) along with its team members, University of Dayton Research Institute (UDRI), LM Aero, and Sikorsky Aircraft, is developing a Discrete Crack Network (DCN) module in Abaqus for high fidelity static strength and fatigue life prediction in bolted composite structures. The DCN is formulated by combining mesh independent matrix cracking (MIC) with interface delamination modeling. The toolkit is developed under the sponsorship of the Air Force Research Laboratory, NASA and NAVAIR. 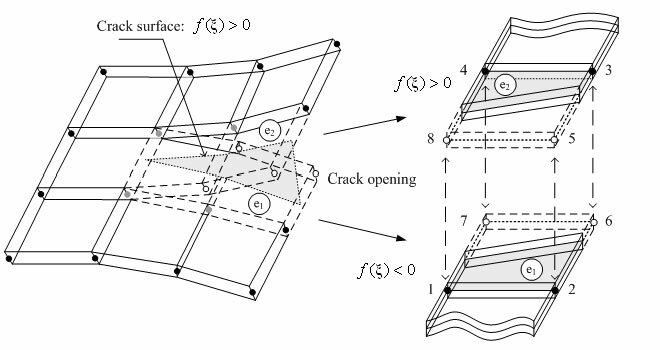 The discrete crack network model for fatigue damage prediction has been developed by combing mesh independent matrix cracking with decohesion at ply interface. A regularized X-FEM framework maintaining the distribution of the Gauss integration points without element slicing has been utilized for implementation of the discrete cracking and delamination network model. 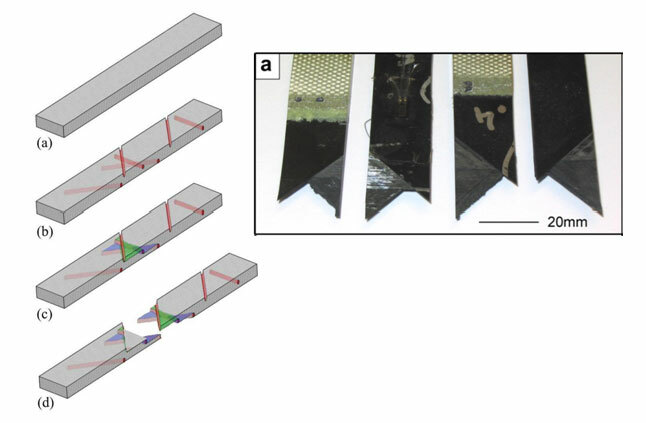 Matrix cracking and delamination initiation, propagation, and their synergistic interaction in the laminated composites are captured without any prior knowledge and/or meshing of matrix crack surfaces. A hybrid crack initiation model has been developed by combining a mixed mode static failure criterion with a ply level strength degradation based on respective S-N curves. Propagation of matrix cracking as well as delamination is described by using the Paris law based cohesive model. DCN can be used to predict the discrete damage evolution associated with matrix cracking and delamination of open and filled holes subjected to a combined bearing and bypass loading. The final validated commercial toolkit in Abaqus will be a key contributor to the total life management of composite aircraft joint structures including damage detection, residual strength and life assessment, repair implementation, life extension, and health monitoring. Both the validation and verification have been performed for the composite laminated plate with and without hole subjected to monotonic loading. Analyses have demonstrated that fracture is dominated by interactions between transverse matrix cracks and delaminations. 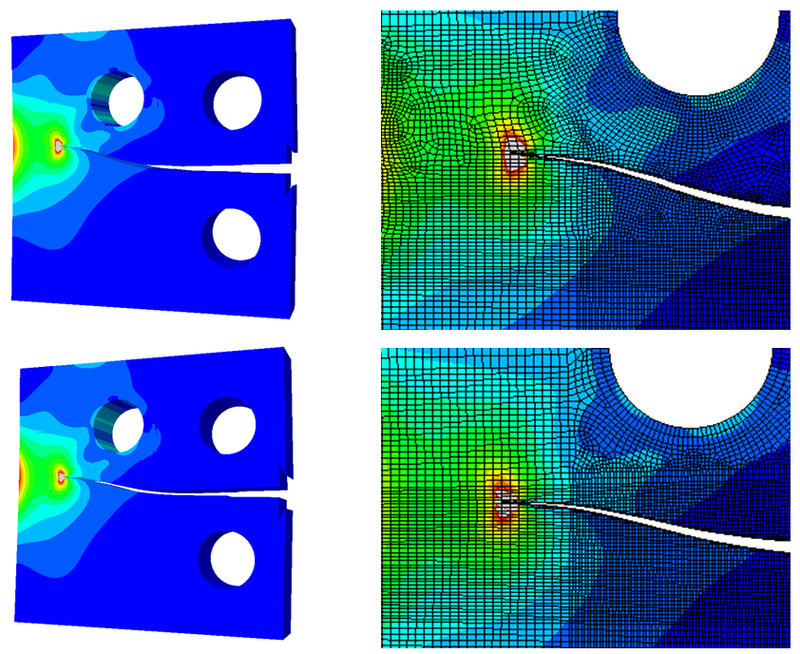 A damage progression sequence of coupled transverse matrix cracking and interlaminar delamination can be correctly simulated using the DCN toolkit for the case of a holed laminated plate subjected to a tensile load. A holed plate with a cross ply [0/90]s lamination sequence is analyzed using DCN. As it can be seen below both the matrix splitting cracks in 0o-ply and transverse matrix cracks in 90o-ply can be captured along with the evolution of delamination. A co-simulation of the discrete damage evolution of an 8-ply laminate of layup of [602/-602]s under a tensile load is also given below using the mesh that is not aligned with the fiber orientation.